Mosquitoes lay their eggs in standing water where the larvae hatch and feed before pupating and emerging as adults. The larvae come to the surface of the water to feed and breathe and then hide from predators under vegetation in your pond. Killing larvae naturally may require more than one treatment. It must be timed for after the eggs have hatched, but before the larvae go into the pupa stage of development. Ponds can be an ideal breeding ground for mosquito larvae. Install aeration pumps or a water feature such as a fountain in your pond. Mosquitoes prefer standing water when selecting a place to lay eggs. The eggs must be close to the surface of the water when they hatch so that the larvae can feed and breathe. Moving water prevents the larvae from hatching at the surface. Run the water feature or the pump for a few hours each day. This will be adequate to prevent the larvae from hatching successfully. Stock ornamental ponds with native fish or minnows or with another larvae-eating fish such as koi. Do not add non-native fish such as koi to natural ponds that feed into larger bodies of water, however. Consult your local department of agriculture to find out which type of native fish would be ideal for mosquito control in your region. Place mosquito dunks, or mosquito control rings, in your pond to kill larvae that are in the feeding stage, which is between hatching and pupating. These small rings contain a naturally-occurring bacterium which kills feeding mosquito larvae and can be purchased at local lawn and garden stores. Mosquito dunks are safe for use in natural and ornamental ponds. Replace the mosquito dunks after 30 days to continue killing larvae as they hatch. 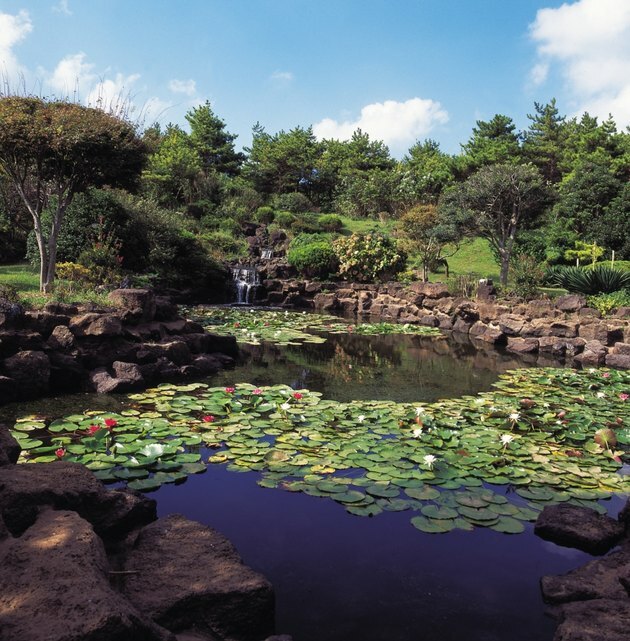 Spray a light coating of vegetable-based cooking oil over the surface of ornamental ponds. Do not use oil in ponds that are naturally occurring or that feed another larger body of water. The cooking oil is non-toxic and evaporates within a few days but it suffocates the larvae by blocking the small tubes that they breathe through when they come to the surface. Remove food sources such as algae by placing barley straw in your pond. Barley straw can be purchased at lawn and garden supply stores and is installed near a water feature. The barley naturally controls algae and is not toxic to aquatic life. Reduce vegetation such as lily pads to eliminate potential hiding places for mosquito larvae. These plants can provide a safe place for mosquito larvae to evade natural predators such as fish and dragonfly larvae.